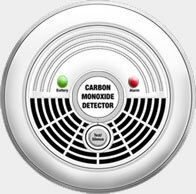 In the past decade, people have become more aware of the risk of carbon monoxide (CO) poisoning in the home. Often called the silent killer, carbon monoxide is an invisible, odorless, colorless gas created when fuels (such as gasoline, wood, coal, natural gas, propane, oil, and methane) burn incompletely. In the home, heating and cooking equipment that burn fuel are potential sources of carbon monoxide. Vehicles or generators running in an attached garage can also produce dangerous levels of carbon monoxide. The risk of unintentional CO death is highest for the very old (ages 75 or above). provide early warning of accumulating CO.
CO alarms should be installed in a central location outside each separate sleeping area. number to find out what number to call if the CO alarm sounds. Post that number by your telephone(s) and make sure everyone in the household knows the difference between the fire emergency and CO emergency numbers (if there is a difference). If you need to warm a vehicle, remove it from the garage immediately after starting it. Do not run a vehicle, generator, or other fueled engine or motor indoors, even if garage doors are open. Make sure the exhaust pipe of a running vehicle is not covered with snow. During and after a snow storm, make sure vents for the dryer, furnace, stove, and fireplace are clear of snow build-up. Have fuel-burning household heating equipment (fireplaces, furnaces, water heaters, wood and coal stoves, space or portable heaters) and chimneys inspected by a professional every year before cold weather sets in. When using a fireplace, open the fuel for adequate ventilation. Open a window slightly whenever using a kerosene or gas heater. (Kerosene heaters are illegal in many states. Always check with local authorities before buying or using one.) Only refuel outside, after the device has cooled. Only use barbecue grills which can produce CO outside. Never use them in the home or garage. When purchasing new heating and cooking equipment, select products tested and labeled by an independent testing laboratory. When camping, remember to use battery-powered heaters and flashlights in tents trailers, and motor homes. CO alarms are not substitutes for smoke alarms. Smoke alarms should be installed on every level of the home and in or outside all sleeping areas. If it is a battery-powered intermittent alarm, check the battery. If it is a steady alarm or you are unable to determine, evacuate the dwelling. Do not re-enter until the responding agency says it is ok.
Report the CO alarm warning by calling the appropriate phone number. Call a qualified technician to inspect all equipment. Severe headache, dizziness, mental confusion, nausea, or faintness. Many of these symptoms are similar to the flu, food poisoning or other illnesses.